What Area of Phuket To Stay With Teenagers? We are a family of five and we will be travelling to Phuket with three young teenagers. Where is the best area to stay in Phuket? Things that we would like to do while we are in Phuket include going on an elephant trek, snorkelling, spending time on the beach and a visit to FantaSea. That’s an excellent question and one that I am sure many parents think about when planning on taking their kids on holidays to Phuket. Phuket is loaded with top spots to stay and I agree it gets a little confusing picking the best area to stay especially when travelling with kids and even more so with teenagers. We have been taking our kids (now both older teenagers) to Phuket for years and have stayed at just about every beach on the west coast of Phuket. We love them all, but personally we prefer to stay along Phuket’s southern beaches of Karon, Kata and Kata Noi. While these beaches still get busy especially throughout the high season, they are quieter, much more relaxing and less hectic then Patong. However love it or hate it, Patong is the centre of all activities in Phuket and is where most people prefer to stay, simply because everything you could want is there. Patong is a great spot if you’re looking for nightlife, shopping, beach activities and if you’re worried about what your kids will eat, there is a selection of western fast foods like McDonalds, Subway etc. If you do decide to stay in Patong I would have a look at staying around the southern end of the beach or towards the northern end of the beach, which are quieter then being closer to the busy nightlife area of Bangla Road. 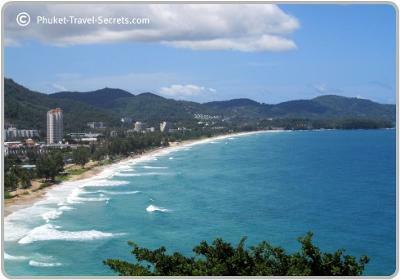 Depending on what time of the year you plan to go to Phuket will determine what beach activities are available. As Patong is a rather large bay, most beach activities in Patong are all year round, whereas some of the other west coast beaches will not have activities like para sailing throughout the low season. Costs of transport around Phuket is rather expensive so you will also need to keep this in mind if you want to spend time in Patong but choose to stay at one of the quieter beaches. What we often do is base ourselves on the one of the quieter beaches for the majority of our time in Phuket and then stay a couple of nights in Patong either at the start or at the end of our Phuket Holidays. I am sure that you will have a great holiday with your family no matter where you decide to stay.